Three-quarters of charities feel they do not have the digital skills to protect themselves from fraud and scams, and more than half are lacking basic digital skills, according to a report from Lloyds Bank. 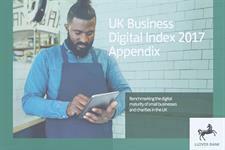 Published today, the UK Business Digital Index 2017 measures the digital capability of 2,000 UK small businesses, including 500 charities, using a combination of actual online behaviour and survey analysis to understand their attitudes to digital technology. Although 58 per cent of charitable donations are given in cash, the growth in online payment capability and the increase in online accounting services (two in three charities are now using these) means that there is a need for charities to improve their online safety and security, the report says. But the report says that 75 per cent of UK charities are not confident of preventing criminal activity. The index says that more businesses and charities are becoming more digitally capable, but there is a growing minority of organisations with low capability, including an estimated 100,000-plus UK charities that lack one or more of five “basic digital skills” (see “Basic digital skills in the report”). Of the 52 per cent lacking basic digital skills, 5 per cent of charities had none of the five. Problem-solving: increase independence and confidence by solving problems using digital tools and finding solutions. However, nearly half of the 500 charities surveyed do have the full set of skills, the report says, and 20 per cent (equating to about 40,000 charities) are “on the cusp” of gaining full basic digital skills, with four of the five areas covered. The report says that the areas most lacking among voluntary organisations and which need most focus are those of “managing information” (missing in 42 per cent of charities surveyed) and “problem-solving” (36 per cent). Compared with a similar exercise carried out last year, the 2017 report says that problem-solving “continued to be the skill with the greatest opportunity for development” among charities. It saus although 64 per cent of charities exhibit these skills, there is scope for many charities to take advantage of using technology to help them reduce costs and increase efficiency. The report says the number of charities using online analytics remains very low, although it has increased from 6 per cent in 2016 to 11 per cent this year, and 81 per cent do not store digital information on their customers and suppliers. The authors say this presents “a huge opportunity for charities to learn more about their donor and volunteer bases using free trails such as Google Analytics or Webtrends”. Almost three-quarters of charities report time savings as the greatest key benefit, increasing to 90 per cent among those regarded as the most digitally capable, says the report. Attracting more volunteers and donors, more effective marketing and increased interaction with supporters, simplified payment and donations processes, and cost savings also feature highly among the benefits to organisations with greater digital skills. The report says that organisations with high digital capability are more likely to invest further in digital; 83 per cent of this group say they are confident in the future of their charities and are twice as likely to see growth as important or very important to their charities’ strategies. Among those charities with the lowest digital capabilities, motivation remains the biggest barrier, the report says. More than a third (33 per cent) of those in this group say that being online is not seen as relevant, a figure that has remained virtually static since 2014. However, a lack of staff digital skills (31 per cent) and a lack of time (24 per cent) are also seen as major barriers to developing digital capabilities.